Welcome to our Close to my Heart Stamp of the Month BLOG HOP for August featuring "It's Your Day" acrylix stamp set which you can get at a great discount or even FREE with an order from now through August 31, 2009! by over 60 different Close to my Heart consultants, you'll have done the full circle when you come back to where you started! I can't wait to click through and see all the fabulous creations from my sister consultants! We have some serious talent in this company! To follow along on this hop you just need to click on the link at the end of the post on each blog to move along to the next site. Afraid you'll get lost? No worries! The list of all participating consultant sites is at the very bottom of this post. Now on to my card! "It's Your Day" is such an all around great birthday stamp set I just know you are going to love adding it to your tool box! I've been using this set on so many projects lately especially in bright colors that I wanted to switch things up and use some softer colors. 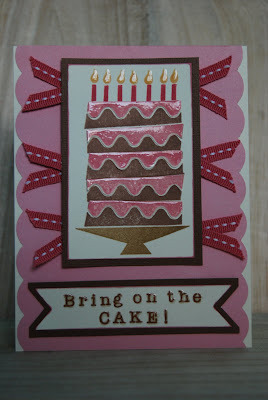 Here I've used the colors from More to Adore (Blush, Chocolate, Hollyhock) and added a bit of Creme Brulee to make a "sweet" card. I just love how the liquid glass makes the cake look like it has lots of gooey frosting just waiting to be eaten up! Here is the first rendition of this card. 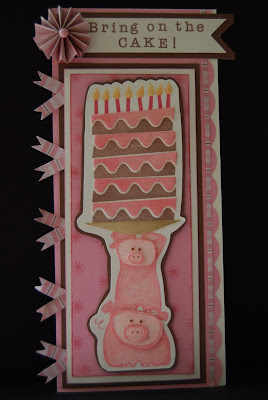 My hubby said he didn't want to think of pigs when he was eating his birthday cake so I decided to make another one without the little piggies but I had to share this card! I love the way the pigs hold up the cake! Now get your frog feet on and continue hopping on over to Wendy's site to check out her artwork! Be sure to visit all the consultants on their blogs to get some great crafting ideas! Remember, the stamp of the month is only available through August 31, 2009! If you aren't currently working with a consultant, I would be honored to be chosen as your personal consultant and am happy to answer any questions you might have about our products, company or my artwork! To check out our Stamp of the Month program simply click here and find out how you can get "It's Your Day" at a great discount or even FREE! Listing of all participating consultants! Love your cards. The little pigs holding up the cake are just too cute. wow, love the lg on the frosting and the candles. LOVE your cards. I have to agree with your husband, I don't want to think about pigs while having cake, but they certainly are adorable. cute cards, how fun they are. Now that is cake! Love it! Love these cards Paige!! Your cake layers are amazing! The pigs are just ADORABLE!!! Love how you added all the layers of the cake to show the pigs really struggling to hold the cake....brilliant! So cute - love the frosting! Thanks for hopping with us! Have to disagree with the hubby...the piggies are adorable! Love the piggies. How do you think of these ideas? I need to learn how to think outside the box! OMG - the piggies are just soooo adorable!!!! I do love the 1st card - gorgeous! Love how you stacked the cake taller and the frosting really pops! I look forward to meeting you in DC in 2010! What a clever idea! Piggies holding up the cake - oh my!